Do you ever feel like you need cake for breakfast? Not a whole cake, of course, but a slice. Or two. On a dreary morning, there's honestly nothing better than a warm, slightly sweet piece of cake. Especially when there's a beautiful, glossy layer of caramelized strawberries on top. Because who doesn't like a bit of pink in the morning? The sour cream keeps this cake incredibly moist. Even after a stay in the freezer, it was delicious and tasted fresh, which is good news because I rarely have time to bake in the mornings. 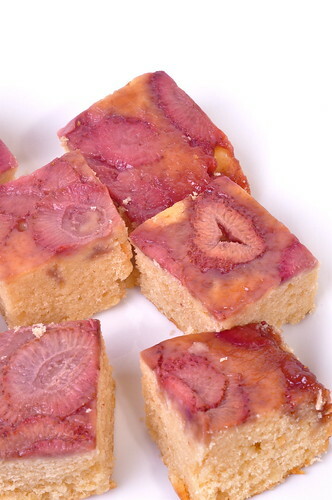 The brown sugar forms a sticky, golden crust and softens and sweetens the strawberries, making them almost candy-like. 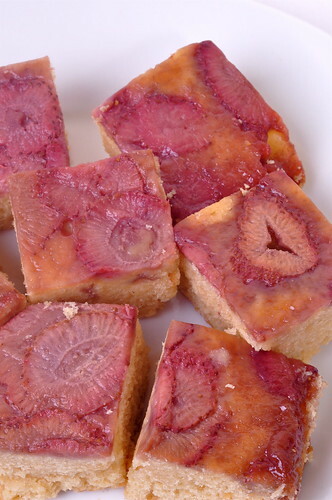 It makes a lovely everyday cake, but it is dressy enough to serve for a special occasion. Preheat the oven to 350 degrees. Place the 2 tablespoons of butter in the cake pan, and place the pan in the oven. Once the butter has melted, remove the pan from the oven, tilting to coat the bottom. Sprinkle 1/4 cup brown sugar over the bottom of the pan. Arrange the strawberries in a single layer. Whisk together the flour, baking powder, salt, baking soda, and cinnamon. Cream the butter and brown sugar in a bowl until light and fluffy. Add the egg and almond extract and beat for about a minute. Slowly add the dry ingredients and beat until fully incorporated. Fold in the sour cream. The batter will be quite thick. 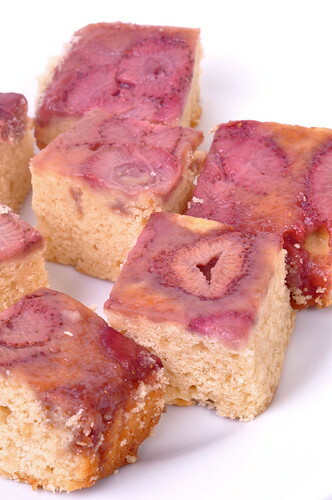 Spoon the batter over the strawberries and spread evenly with a spatula. Bake for 35 minutes, or until a knife inserted in the center comes out clean. Let cake rest for 10 minutes. Invert onto a cake plate. 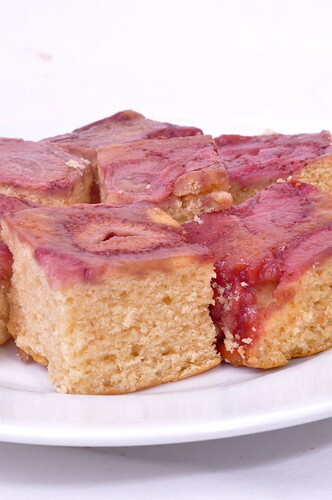 I love all these upside-down cake ideas! I've always made pineapple or peach so I can't wait to try these!